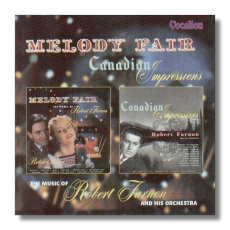 This is the third volume of music from Robert Farnon and his orchestra and it brings together another two classic LPs from the early mono era. We have already had recordings of several of the pieces in this collection in more modern guises but none have the intrinsic charm and flair that permeate these authentic recordings. The classic pieces, 'Melody fair', 'Jumping Bean' and 'Portrait of a Flirt' really come alive in the superb Decca sound, indeed you would be hard pressed to detect the recording dates that go back to 1949 in some cases. The peaceful side of Robert Farnon in; 'How Beautiful is Night' and 'In a Calm' also reveal the luscious side of the string effect that the composer managed to coax out of his orchestra. The Canadian LP is no less impressive with the gorgeous 'A la Claire Fontaine' and 'Lake of the Woods' top on my list. More local fare is amplified in 'Prarie Sunset' and 'Canadian Caravan', to my mind the only recordings of these pieces available now. Michael Dutton's superb remastering brings a lifelike quality to the excellent Decca tapes and I cannot hesitate to urge all lovers of light music to snap up this wonderful issue.